Na na na na na na na na Diatoms! 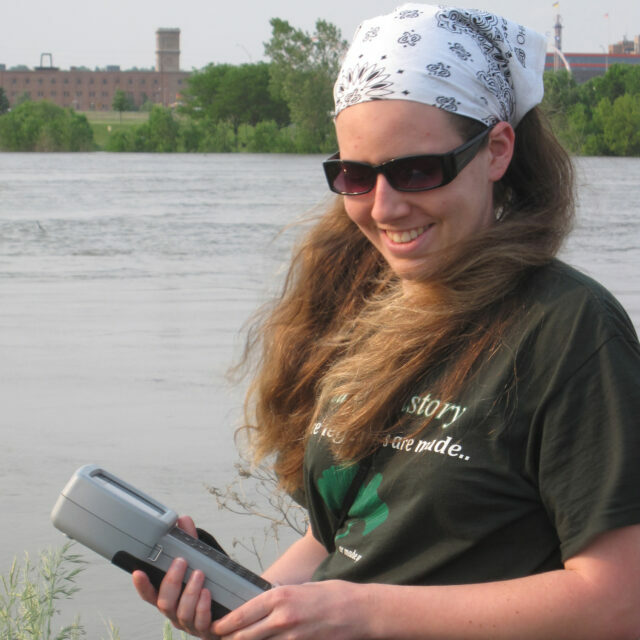 I have always loved the sciences, especially those that deal with the outdoors, but it wasn’t until college that I focused my interests to aquatic ecology. While attaining my BS in Environmental Studies at Ohio Northern University, I learned about the strong interactions between the physical, chemical, and biological components of an ecosystem and how environmental disturbances can lead to major changes in these habitats. As a summer intern with the Mercer County Soil and Water Conservation District, I experienced firsthand how government environmental agencies work with the public both to promote conservation practices and to remediate environmental issues such as the cyanobacterial blooms on Grand Lake St. Marys, Ohio. I studied macro- and microalgae under Dr. Robert Verb; nothing is quite as invigorating as collecting samples in the middle of January in a four-inch-thick ice-covered creek! With such forays into phycology, I have since then continued researching algae as a graduate student in the Environmental and Plant Biology Department of Ohio University in the lab of Dr. Morgan Vis. My master’s thesis is examining how acid mine drainage and macroinvertebrate grazing affect benthic periphyton growth. Diatoms are one of the main inhabitants of periphyton communities, are excellent organisms to study environmental tolerances, and thus will be a great help in my research.